Over the last year or two, Facebook has been heavily pushing Messenger. What began life as the ability to direct message people on the platform has evolved into a stand-alone app. Today, if you even try to check your messages via the web-based version of the site on mobile, you’ll be prompted to install the Messenger app instead. On top of this, Facebook just launched Messenger for Kids, a version of Messenger aimed at children under the age of 13 – the COPPA age – with parental control. It’s essentially messenger with a few kid-friendly features and a whitelist for contacts. Parents have to approve who their children are allowed to talk to, which helps minimize child predation, at least for people under 13. Teenagers get the short stick, I suppose. It should come as no surprise that Facebook really likes it when businesses use Messenger themselves. Every Facebook business page has the ability to enable or disable messenger. If you have it disabled, you’re missing out on a potential line of customer inquiry. 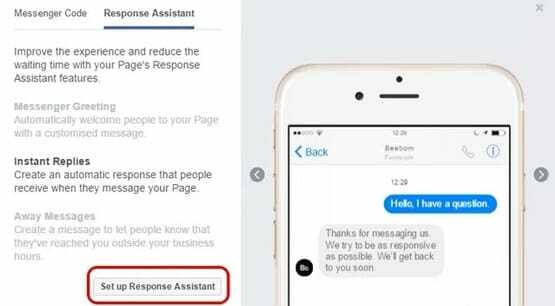 If you have messenger enabled, it changes three things about your page. 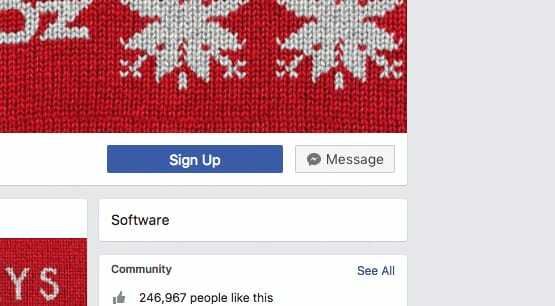 First, up at the top of the page, on the same bar as the like/follow/share buttons and the CTA button, a new “send message” button will appear. 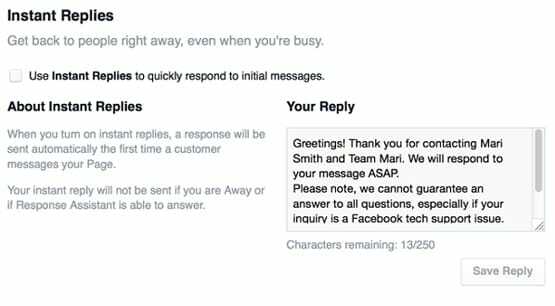 This allows anyone who wants to contact you the chance to send you a message via Facebook Messenger. Second, in the About section on the right sidebar, a line about messaging appears. This line says something like “Typically replies within a day” or “Seldom responds”. It’s an indicator of how long a user might have to wait to get a response. Third, as these Reddit users are discovering, there is a way to make Facebook automatically pop up a message to new users. You can see this in action when you visit a page like Moz. When you open that link, you’ll get a message from Moz. It has their cover photo, profile picture, response times, and an informational box. It also has a series of questions in bubbles, which are frequently asked questions you might want to know the answer to. Users can tap or click on one of those questions to see an answer immediately, or be shuffled through to the next successive question, as the case may be. 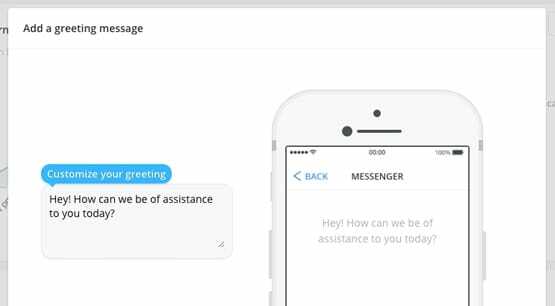 Users can also type their own question, which will be compared to existing questions by the bot – yes, it’s a bot – and either answered or forwarded on to the employee in charge of managing customer service. The automatic message pop-up is one of two things. It’s either a default Facebook greeting message, or a welcome prompt from a chatbot. In Moz’s case, it’s the chatbot option. Blank, short, or spammy messages are all examples of greetings poorly done. Also, no, this has nothing to do with Facebook’s experiments in AI chatting that have had such a controversial time. I, for one, welcome our robot overlords. How does Facebook pull this off without violating rules against unsolicited messages? After all, it’s those rules that keep businesses from sending out mass mailers via Messenger, or from spamming random people who they come across. The answer is the intent. Even if you haven’t opened up Messenger to send them a message, you HAVE visited their page. That is considered enough of a contact intent to allow Facebook to implement something like this. You can’t message people automatically or in mass numbers. You can only trigger a message when they arrive on your page. So what is this feature, anyway? It’s actually two different features nested in the new Facebook inbox they released throughout the past year. If you navigate to your page, and then click Settings, you’ll see a Messaging section on the left. Click it, and you’ll see the following options. Prompt visitors to send messages. This is a toggle that determines whether or not your page will open up the messenger when a user arrives on your page. It should be noted that this only works if you meet one of two conditions. Either you or a designated admin is actively online, or your page has earned the “very responsive to messages” badge. Help people start a conversation with your Page. This is a subsequent toggle that you see on Moz. Essentially, it allows you to set up questions that a user might ask, to remind them to actually ask or to give them easy access to answers. Beneath those two, you have the Response Assistant options. This is Facebook’s in-house default chat bot, which you can configure to work however you want it to work, with a little time investment. Stay responsive when you can’t get to your computer or phone. This is another auto-response, but it triggers when you’re not available, as opposed to the one above, which triggers when you’re available but not actively responding, perhaps due to responding to other customers at the same time. Show a Messenger Greeting. This is a specific welcome message that triggers when the user opens messenger, before they have sent a message. The above two trigger when they send a message; this one prompts them to send a message, or allows you to forestall the most common question up front. For example, you might turn this on during the holidays to list your holiday store hours, so you don’t need to manually respond with them every time someone asks. Pre-Appointment Reminders. This is an automatic response that only works if users use Facebook as a calendar to store meetings with your business. If that’s the case, this setting allows Messenger to send a reminder 24 hours before the meeting. Send follow ups to anyone who books an appointment. This is a pushy feature to get people who have registered for an appointment to register another one once that initial appointment has concluded. You can set the specific time frame for how long after the appointment this message will trigger. These are just the most basic features you can set from the Facebook Page messaging settings. There’s a whole world of additional features I have to show you. 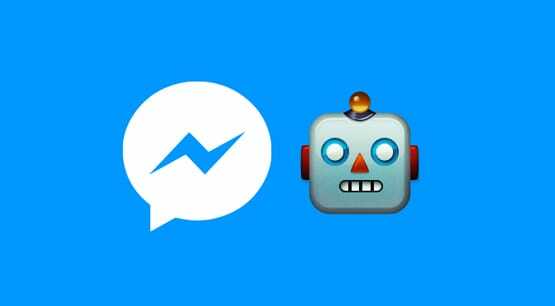 Facebook actually has a more advanced chatbot system that you can use to create a fully developed messenger app for your own business. You can read all about it here. This platform is actually just a robust way of accessing Facebook’s messenger APIs with semi-customized code. 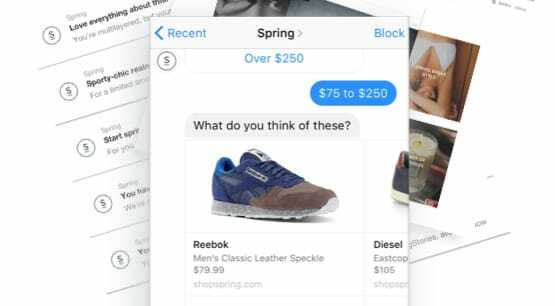 You can create your own messaging app using their framework, which can piggyback on Messenger to allow you to reach out to customers when they want to chat with you. This is the kind of advanced implementation that Moz uses. Rather than give you a tutorial on how to use it, I’ll just point you towards the Test Drive. This is Facebook’s demonstration of how a Messenger App works, and it’s fairly decent. You’ll then be able to customize the basic app, or develop your own. If you’re an app developer, you already know more than me, so I won’t pretend to lecture you on it. As far as Messenger App best practices, Facebook lays out a lot of guidelines. I’ll summarize those here for your convenience. Start by figuring out what purpose messenger is going to serve. Will people be able to book appointments and RSVP? Is it a customer service hotline? Do you just want to chat and get to know your audience? Figure out what features you need and where you’ll grow. Determine how much of a GUI you want. Moz is about the halfway point. At the non-GUI angle, you have pure text. Pure text looks like there’s a person on the other end, though savvy users or users who get caught in misunderstandings will recognize a bot. Moz has some obviously-a-bot guided messaging to help you help yourself. It works a lot like a phone tree at a major company; navigate through the bot system to reach a human, or have your issues solve with the automated systems if they can be. Maximum GUI involves product images and full interactive app features, but will be much more complex to design. Strive to keep your messaging brief. People tend to respond quickly and don’t have a lot of attention for more than brief thoughts in a messenger conversation. People are interrupted and forget their place all the time. Avoid situations where you’re waiting on contextual responses. People break the flow of conversation all the time, through distraction or through intent. Don’t let your bot end up in a state where it can get stuck not responding to invalid answers. Avoid disguising a bot as a human. Most of the time people won’t believe you, and it doesn’t add any benefit to make a user think they were talking to a real employee when they weren’t. Conversely, letting them know when they’re talking to a bot and when a human is responding can be beneficial. Feel free to make use of buttons, quick pre-formatted replies, and the persistent menu features to always provide structure and value to users. You don’t want them to feel like they got lost down the wrong train of thought and are better off cancelling the conversation entirely. Be predictable and transparent. For example, if a bot is processing, use the “user is typing” indicator to let the user know a reply is incoming. Make sure to follow similar best practices for confirmations, subscription opt-ins and outs, etc. Don’t create a new profile for your bot. Your bot is an extension of your brand page, it is not a separate entity. If it’s a separate page, people will feel like they’re potentially talking to an imposter, or they simply won’t be able to find it. Preserve your business tone and voice. If you’re a casual daycare, you don’t want an overly-corporate bot. Conversely, if you’re a corporate-level HR firm, you don’t want overly casual conversations. Minimize the use of push notifications. Messenger has its own alerts; you don’t need an additional push notification for everything. Use them in a limited fashion for specific important interactions. As for actually creating the conversation flow, you’re going to want to set a list of keywords that are relevant to the types of interactions people will have with you. What questions do they ask, and what key words or phrases identify those questions? Remember that no two people will ask the same question with the same exact phrasing. Also, take into account typos and misspellings. A lot of people are, well, not that proficient at their language. That, and plenty of people might not speak English. How can you sound conversational? I would recommend having a writer on staff, but if you’re doing it yourself, make sure to keep up the active voice, use contractions, and standardize whether you’re using specific pronouns. Are you using “I’ll do this” or “We’ll do this” for a message? Don’t over or under-use punctuation, and use it appropriately. Consider the tone of your messaging, and run a spelling and grammar check over everything before you implement it. If all of this is too much for you, you can always consider using a third party service to develop your bot for you. Several such services exist, like ChatFuel and ItsAlive. Hey, maybe I’ll cover those next time. We’ll see! So, how do you edit the default questions in “Help people start a conversation with your Page” ? There’s no option showing.